What is your earliest memory...........relating to family matters? I can remember when I was about 8 or 10 sitting on metal chairs, between two houses, talking to (Gertrude O'Rourke Dowd Graham) my grandmother. She would tell me about her family. She said her mother was her best friend. My grandmother was the youngest of ten children. She told how sad she was when her mother died. After finding the records her mother died in 1924, Ellen Martel/Mortel was born in 1852 in County Limerick, Ireland, but one cousin I found thought that maybe she was born in County Donegal. On her death certificate I found it stated Limerick and her father listed was named Patrick. Ellen died at the age of 72, that was very old in a time when the life expectancy was about the age o f 40. Looking at her death certificate it seemed that she had died of heart disease. She talked about her father Patrick O'Rourke. I think she and her father fought all the time. One time she told me that she had wanted to go to a dance and her father said no. She tried to escape thru the upstairs window. She dropped her coat out the window and planned to climb down the porch to escape. Well, she dropped the coat on her fathers head and he beat her because she did not listen to him. I would like to know her age at that time because she was widowed young and perhaps she was living in her fathers house and already an adult. Patrick probably thought she should stay at home with the children rather than going out and to a dance. Both Patrick and Ellen had emigrated from Ireland in 1872. I did not know if they were married or single. But the 1900 census had listed them as being married for 26 years, that would mean marriage in 1874. They were both in this country for two years at that time. I have to find the church where they were married. Their first child was Anne (Gehanna--as stated by her grandaughter who I have recently found). Gehanna is a beautiful name, about a year ago a young girl come into the hospital where I work and her name was Gehanna. 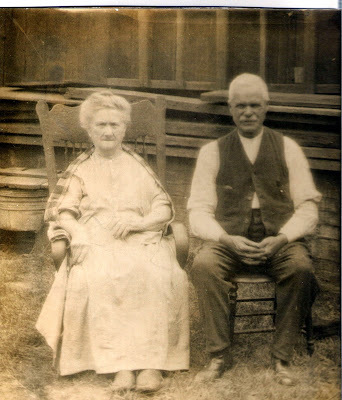 Anne was born in 1875, it appears that she was the first child of Patrick and Ellen. From the Irish naming patterns it seems to be that Denis would have been named after Patricks father. A woman on the Allegheny County roots web remembered that I was searching Patrick O'Rourke and she sent me an obituary for Mary O'Rourke Rogan who lived and died in New Castle PA. Mary was born May 6, 1864 in Limerick Ireland. It had listed her parents Denis O'Rourke and Mary O'Rourke and a sister Mrs. William Collins of Limerick and brother Patrick O'Rourke of Pittsburgh. In my fathers hand written notes he had also listed Patricks sister Mary Regan (Rogan) and a brother James. Funny how little thing fall together. Pictured above Ellen Martel and Patrick O'Rourke circa 1918. 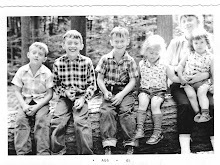 Ellen Martel/Mortel and Patrick O'Rourke are my father Thomas Dowds grandparents. His mother Gertrude O'Rourke was one of the youngest O'Rourke children. They are Claudia's great grandparents. I have been researching my family history for two years now. My regret and probably the one of many thousands of others is that they did not start sooner. I guess it was one of those thing where you do not think of it till you get passed middle age. My husbands cousin was searching for a long time and I thought it was interesting but it was not until my parents had died and I was going thru their papers that I found some interesting things. First was naturalization certificates for my great grandfather and grandparents. Second was cemetery lots and the original purchase papers, birth certificate and marriage certificates for my grandmother written in Old German Script. I needed to know more.....I feel that my progress has been good for such a novice, and I will try to post things with tags so perhaps I may find some more cousins looking for the same people.